The day has finally come that my little smarties, Jack and Christopher, are entering Kindergarten. I can’t believe it! I thought this day was never going to come. You know the old saying, “days are long and the years are short” – well, with twins double that! Everything seems extra long or a complete blur… I am exhausted and am ready for a break. All summer, I have been talking to them about how amazing Kindergarten is going to be. Pumping them up with comments about meeting new friends, seeing all their old friends, riding the bus, etc. Christopher is over the moon excited. Jack – not so much. I decided to devise a plan to excite them both on their Kindergarten adventure. 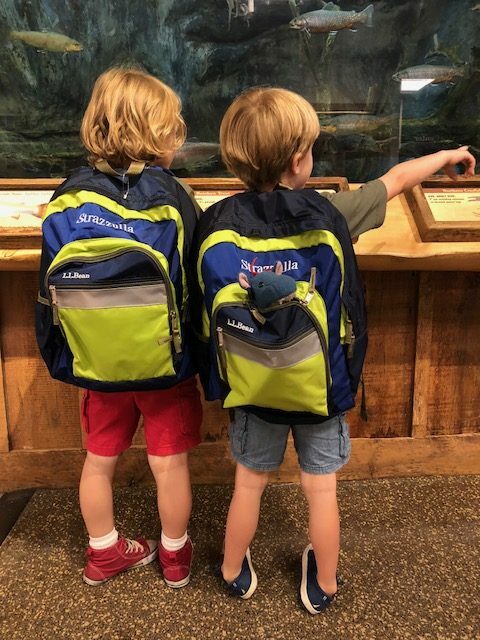 Since we are spending the summer in Maine why not take a day trip to Freeport and let the twins pick out their own special backpack and lunchbox. In my head, this was going to be a “Kodak Moment (or depending on your age you may refer to it as a “Pinterest” worthy moment).” Christopher’s favorite color is red and Jack’s is blue. It is a no brainer – they will pick out the simple blue and red backpacks with matching lunchboxes. We will have them monogrammed with their names. Easy Peazy! I recruited my dad to come with me. Again, I am thinking Kodak moment – Pop-Pop is with us – this is going to be a great day! You always forget the car ride when planning an outing with kids. Freeport is about an hour south of the area where I live during the summer. The drive consists of coastal towns with not a lot of options to stop and grab a snack. About 20 minutes into the drive, the twins started complaining, “Are we there yet? I need water? I am hungry?” Trying to stay positive, I continue my campaign of promoting this amazing adventure. But honestly, they were wearing me out. Finally we arrive at LLBean The twins realize where they are and immediately they no longer have any interest in shopping for a backpack. 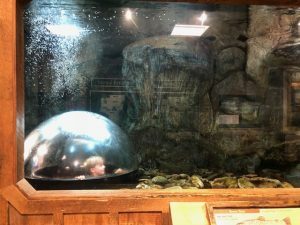 They run straight to the fresh water fish aquarium – to the pond in the middle of the store – upstairs to the kids area- downstairs to look at all the animals – back to the fish aquarium….. Things are not going as I planned. Frustrated, I rally them back to the area with all the backpacks and with my dad’s help we re-focus the twins on why we are here (in their heads this is a place to play). I guide them over to the blue and red LLBean Original book pack. At this time, my perfect plan came crashing down. Jack tells me he wants a bright purple backpack. Thankfully, they did not have one… he kept telling me, “I want something really bright.” Christopher was taking Jack’s lead. He, too, wanted something really colorful and bright. Not able to find exactly what they wanted we decide to take a break and look at the lunchboxes. Immediately, Jack picks out a bright teal color lunchbox and Christopher picks a multi-color (rainbow) camouflage design. I was mortified. Out of all the lunchboxes, my boys picked my least favorite ones. I kept reminding myself: you are letting them pick out their own special backpack and lunchbox. This it their special day! 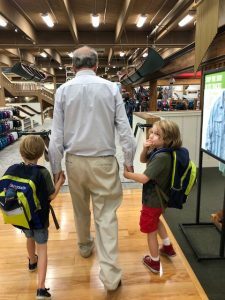 I convince Jack & Christopher to think over their decision and we walk back over to the backpack section. At this point, I am biting my nails nervously. Are they going to pick out the same designs as the lunchboxes? After an hour of 6 year old backpack inspection – trying it on, opening all the compartments, seeing if their special stuffed animal like it, showing it to Pop Pop… we have a winner. It is blue with a highlighter yellow color detail. We head back over to the lunchboxes and I desperately try again to change their minds. Even Pop-pop joined in on the effort. We even walked to a different part of the store where the same lunchboxes were located just displayed differently. There was no tricking them! Their minds were made up and they were super excited & proud about their decision. Backpacks and lunchboxes in tow we head over the check out! Next step, monogramming. My motive here is to have their names spelled out – reinforce learning letters and the spelling of their names. Come to find out there is a limit with the amount of letters – ten. I think to myself, “Okay, we will just do first names.” Strike 1 – CHRISTOPHER is 11 letters. He doesn’t like to be called Chris. He says that is Daddy’s name. So then I think of another option, ” I will just do first initial, last name.” Strike two, our last name is exactly 10 letters. Last name it is. No monogramming needed on the lunchboxes. I doubt anyone but my children would claim them. We are all set! Then, I am hit with the news. Monogramming is backed up and it will take an hour and half. Have you ever waited an hour and a half with twin 6 year old boys in a store they equated as a playground? It is an experience that will turn your hair gray. 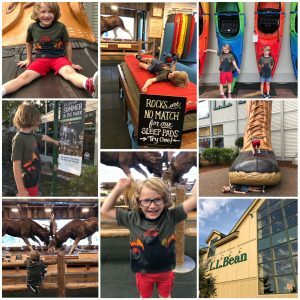 We decide to walk around the LLBean campus. It is amazing! There is the flagship store as well as four additional stores: Hunting & Fishing, Bike, Boat & Ski, Home and the Outlet. It truly is a sportsman/woman’s paradise. Their current marketing campaign is #beanoutsider. Throughout their campus, there are fun activities set up for you to enjoy. Tents to sit in, a giant sculpture of a campfire you can sit around, hammocks to lay in, you can visit it the giant Bean boot, Adirondack chairs, bean boot toss, etc. Every season they have something new. The only problem today was the hottest, most humid day of the summer. Time was standing still. We were all extremely hot and it was wearing on all of us. We went to every store. We looked at every animal- twice. We perused the camping, archery and hunting gear sections. We were skating on thin ice at this point. The witching hour was approaching quickly and we needed to start making that drive back home. My stress level was an all time high. We decided to check the monogramming early and happy to find out their bags were ready! The ladies were super excited when they realized the packs were for Jack and Christopher. The twins had explained to them it was their special day to pick out their special backpacks because they were going to Kindergarten this year. And then they introduced them to their best friend, their Pop-Pop. Right then, right there was my “Kodak moment.” My heart was full. The heat, all the chasing, all the whining was all worth it just for that one moment. Overall, they were just being kids. It was me that was complicating things. This moment is why we were here. Christopher and Jack are proud and excited for this new chapter in their life! 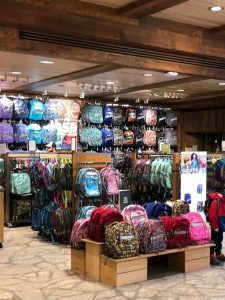 Smarties, LLBean is having a backpack sale. Hurry up! The sale ends soon.